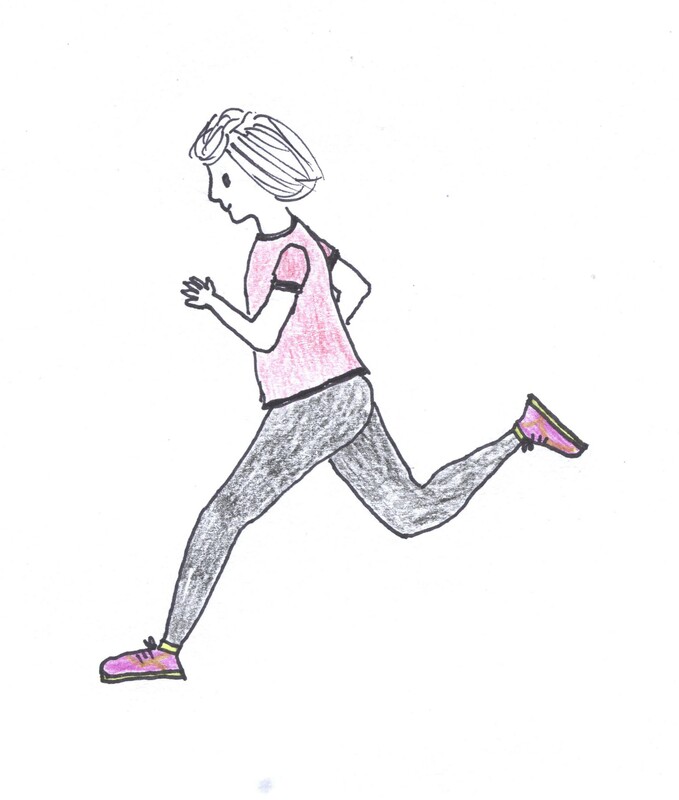 This entry was posted in Life and tagged Half Marathon, Running, The Flying Beetroot. Bookmark the permalink. You could also wipe out the ‘K’ in KM and do 5 metres. Think how fit you will be to do other things. Do you offer personal training? I think we’d get along really well. You’re awesome, Beetroot! I could be issued the challenge AND the spreadsheet and would still be found on the sofa wiping toast crumbs off my chin. So I submit there’s the blood of a champion flowing through your veins. Did M-R do that spreadsheet? If not, we know she’ll love it anyway. I think it’s just the blood of a very stubborn person. I appear to have an almost pathological need to prove I can do things. Mostly to myself. 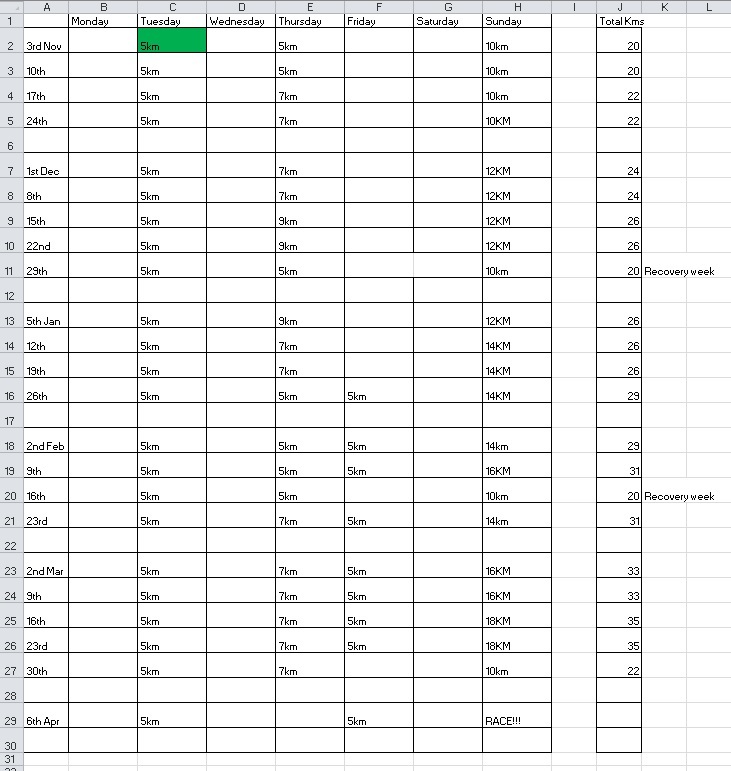 Spreadsheet was done by my marathon-running-personal-training-former-Trailwalker-teammate friend who kind of knows what she’s talking about. So long as you don’t end up as coleslaw ….. I could be well and truly juiced by the end of all this. I’m just sitting here (not running) and smiling at the story and the comments. You go, girl. And which of us is the more sensible, do you think? How funny you are….the Flying Beetroot! I can see the comic books, movies, and stuffed toys now……the world’s newest superhero arrives on the scene! In my case, I’m afraid it would be the Non-Flying, Just-Beat Root. Oh, you really shouldn’t put ideas in my head…. I think there’s at least going to have to be a t-shirt. 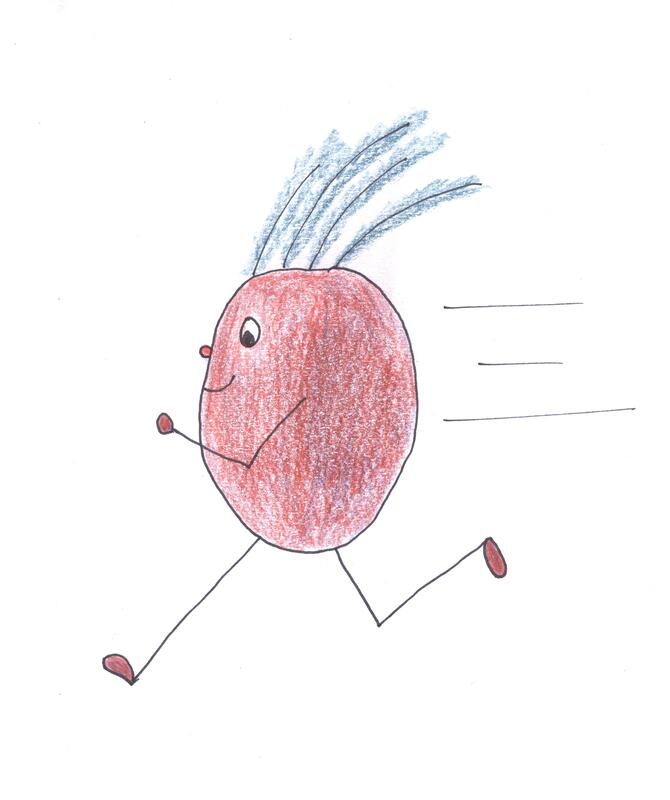 Best of luck oh mighty flying Beetroot! Thanks, Sue! Pity I can’t train on Tuscan hills…. I did appreciate seeing all these comments as I dragged myself out of bed this morning to check off the next box. But this is marvellous, H ! – not only the challenge, and the total impossibility of its being failed once accepted, but The Flying Beetroot,as well ! 😀 I’m jealous: I never thought of a nom de nym. We know we shall overcome; so here we go, hand in hand towards the sunrise. Good luck to us ! I didn’t think it was marvellous when the alarm went off at 6 o’clock this morning. I thought, “Bloody spreadsheet.” But I got up and ran so I grudgingly acknowledge its power over me. And it always feels good once I’m out there. But in my worser days I consumed packets of Lurpak. The Lovely Lurpak and Her Levitating Lard? The moniker though – I’m not so fond. Really? Beets bleed. Sweating blood is a bad thing. Mm. Nope, sorry, I have become attached to the Beetroot. I expect to shed plenty of blood, sweat and tears before the end of all this. Beetroot has a lovely positive ring about it. You could do worse – you could be an orange squash. Good luck with the training schedule. Weekly updates? We’ll all be rooting for you. I think it’s also rather Australian. What’s an Aussie hamburger without beetroot? There will be updates but probably not weekly. I mean, it’s just “I went running some more” really. But I’m sure the Flying Beetroot will have some stories to tell. The flying beetroot does have a ring to it. I think you’re brave even contemplating such a schedule. Well done for even thinking about it! Shall be interested to see how the spread sheet develops, maybe you need different colours to represent different things… ? Thanks, Barbara! I’m rather hoping the only colour to make it onto that chart is Green. Green means I did it. Any other colour would be… disappointing. 😀 This is what I love about using vegetables for noms de plume – the allegories are hilarious. Oh, that’s clever! Well done!